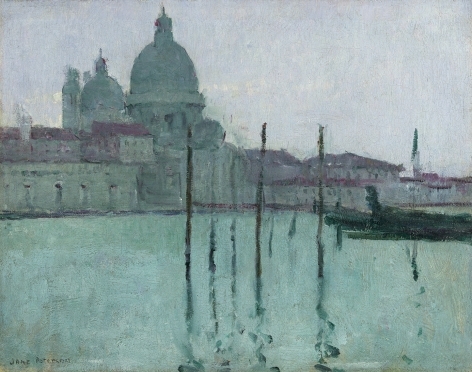 From the early 19th Century to Contemporary times, the sea has fascinated American artists. Fitz Henry Lane's luminist views of the coasts of Massachusetts and Maine portray sea travel and the bustling port towns of the period. 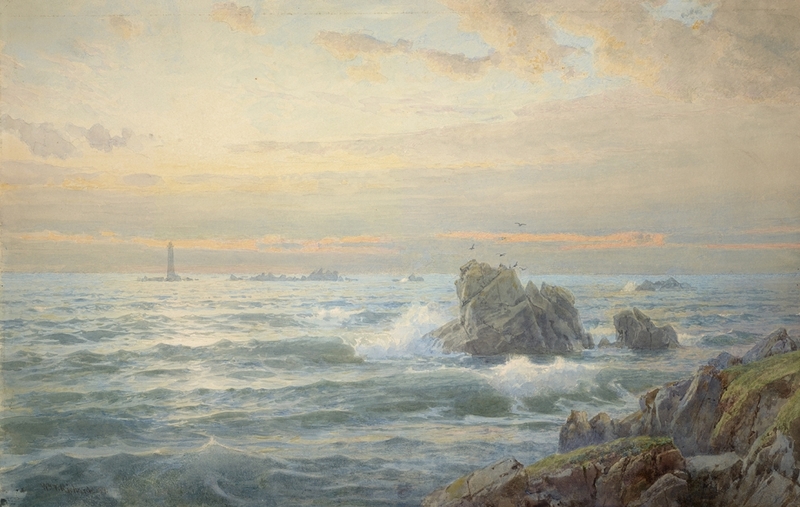 William Trost Richards, painting along the northeastern coast of America and the British Isles, and Alfred Thompson Bricher, painting from New York to the Bay of Fundy, focus on the sea and coastal terrain, interrupted here and there by human presence. 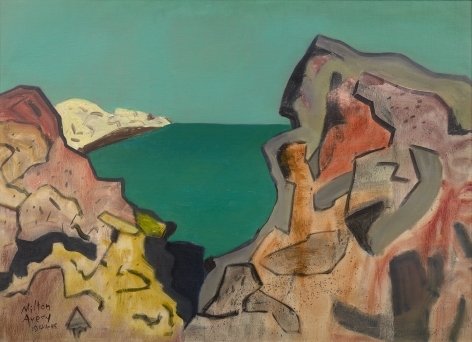 Francis Silva’s luminist views of Haverstraw Bay and coastal areas around New York and New Jersey, tend to portray more topography and diversity of craft. 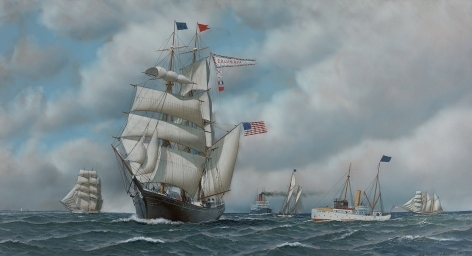 Considered the master of American marine painting, James E. Buttersworth’s focus was on the boats, yacht or ship depicted in minute detail. Although he painted ship’s portraits, his America’s Cup Race paintings are his most successful and highly sought. Artists such as William Bradford and Edward Moran depicted fishing, commercial shipping, or harbor activity in their seascapes. 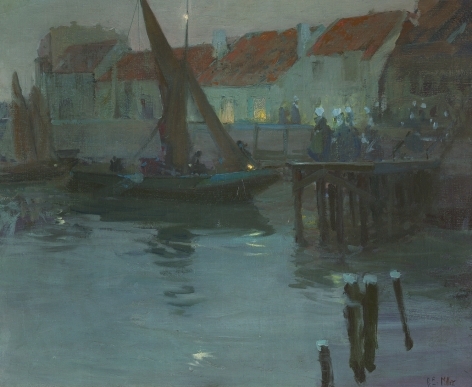 Sailors or fishermen figure prominently in these works, which are in essence action-filled and narrative. Winslow Homer, from his studio in Prout’s Neck, Maine, witnessed the sea in its varied states from treacherous and life-threatening to calm and serene. 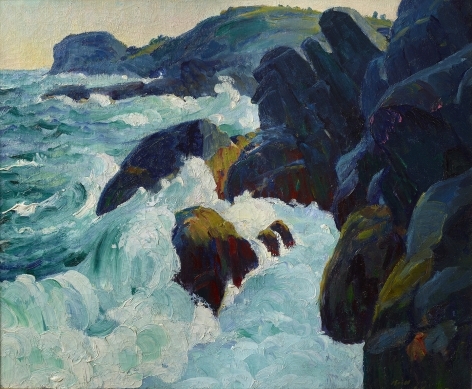 His late seascapes from the 1890s portray the potential danger of turbulent seas on the stormy Maine coast. 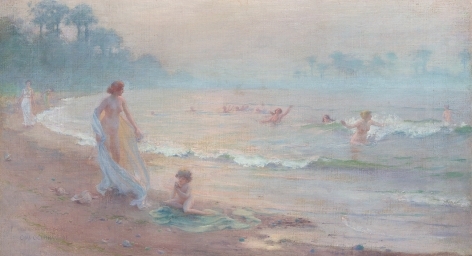 His earlier paintings and watercolors, painted in the 1870s-1880s in Gloucester, show the bucolic nature of the sea on a summer’s afternoon, where boys are fishing, sailing, or merely watching sailboats. 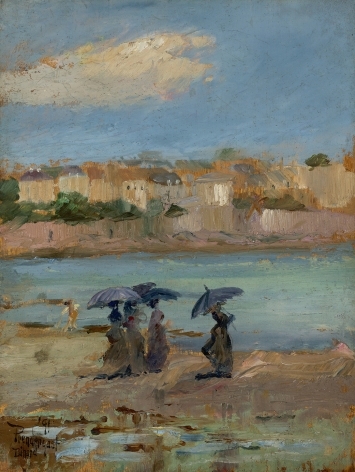 The Impressionists also embraced coastal views as subjects. 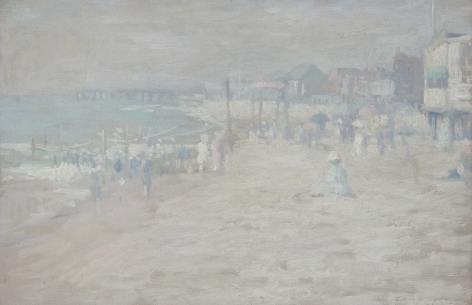 Childe Hassam focused upon the crisp blue waters at the Isles of Shoals, while William Merritt Chase was enamored with Peconic Bay and the dunes of Shinnecock, Long Island. 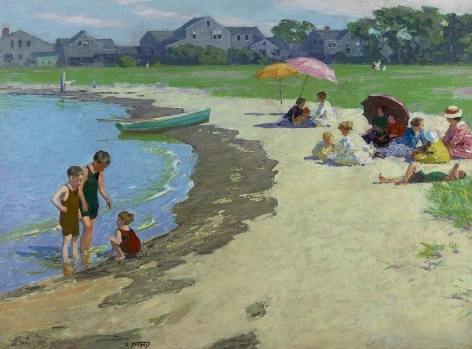 Edward Potthast’s subjects are primarily beach scenes, featuring children at play, ladies with umbrellas, balloon vendors, an occasional dog, and strollers along the water’s edge painted along the coasts of Massachusetts and New York. Maine and Gloucester figure prominently in 20th Century works. 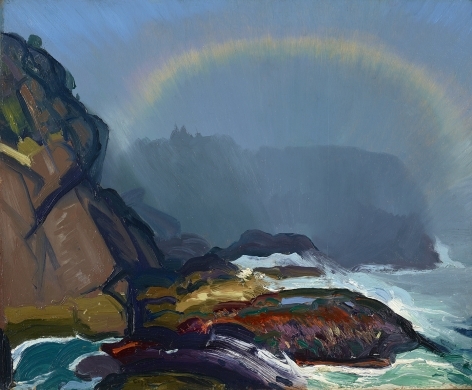 In the teens, George Bellows painted dramatic, churning seas off the coast of Maine, as did Robert Henri, Leon Kroll, and George Luks. John Sloan painted coastal scenes of Gloucester, some with topography and figures, in brilliant palettes and with textural surfaces. 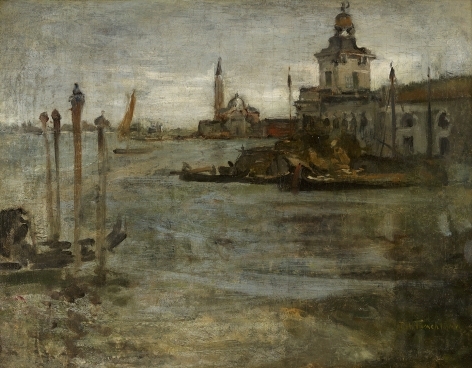 Modernists were also inspired by marine-related themes. 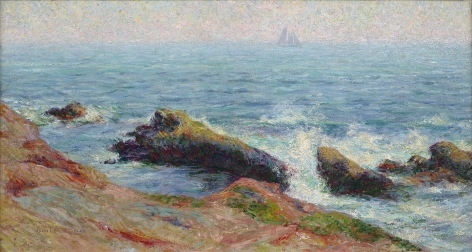 John Marin made watercolors and rarer oils of seascapes with sailing boats off the coast of Maine. 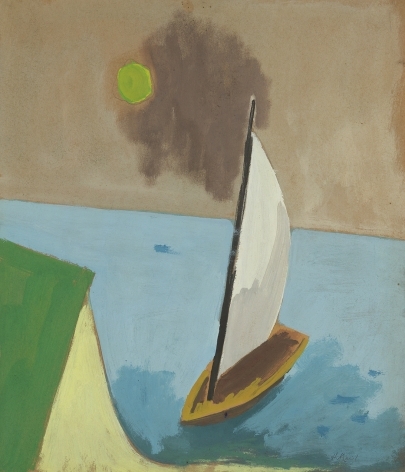 Stuart Davis used imagery from the fishing industry in Gloucester in many of his compositions from the 1920s and 1930s, and Marsden Hartley used marine imagery in many of his abstractions of the teens and continued to use the sea and its creatures in still lifes or in compositional combinations of still life and seascape in the 1930s and 1940s.